Thousands of people are injured or killed as a result of negligent drivers every day. 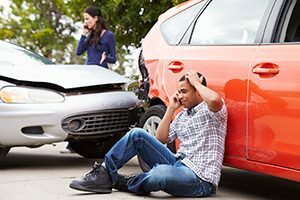 If you have been involved in a car accident, it is important to contact a personal injury attorney as soon as possible following your incident. We can help you take the proper steps and make clear, informed decisions during this difficult time. Contacting us immediately will enable us to begin the process of locating witnesses, scrutinizing police reports and preserving any critical evidence to maximize your recovery. The defendant in a personal injury claim will often be represented by lawyers hired by the defendant’s insurance company. These companies often hire a team of experienced attorneys adept at discouraging a favorable settlement for you. As a dedicated auto accident law firm, we have your best interests in mind. Call Hales & Associates, A Professional Law Corporation immediately at (951) 489-3320. We will review your case for free. Remember: you’ll never pay a fee unless we recover damages on your behalf. Hales & Associates, A Professional Law Corporation represents victims of auto accidents seeking compensation for their injuries in Murrieta, Temecula, Wildomar, Menifee, Sun City, and Lake Elsinore. Call us today at (951) 489-3320 to schedule your free consultation with a trusted Temecula attorney.